This book constitutes a critical case study of the modern search for public sector reform. 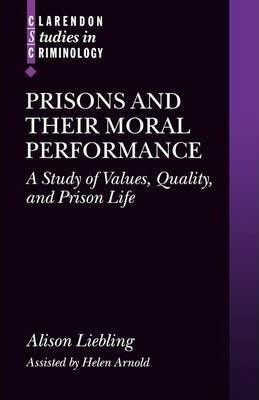 It includes a detailed account of a study aimed at developing a meaningful way of evaluating difficult-to-measure moral dimensions of the quality of prisons. treatment by those above them. The book attempts a detailed analysis and measurement of these dimensions in five prisons. It finds significant differences between establishments in these areas of prison life, and some departures from the official vision of the prison supported by the performance framework. impact of this concept of performance and the links apparently forged between managerialism and moral values. Alison Liebling is a University Lecturer and Director of the Prisons Research Centre at the Cambridge University Institute of Criminology. She is also a Fellow of Trinity Hall, Cambridge. Helen Arnold is at the Cambridge University Institute of Criminology.